Cabo Pulmo is quite simply the best snorkeling and diving spot in the Cabo San Lucas area. A National Marine Park featuring over 350 varieties of tropical fish and marine life, Cabo Pulmo is home to the only living coral reefs not only in Los Cabos, but in the entire west coast of North America. The waters of Cabo Pulmo are the clearest in the Cabo San Lucas area, with visibilities sometimes exceeding 100 feet between June and November. The marine preserve is about a 2 hour drive from Cabo San Lucas, so you'll have to make sure you have time before booking this unique snorkeling tour. Our first snorkeling site is Mermaids Beach, a small protected bay loaded with juvenile fish. Our second site is the Sea Lion Colony. Here you will swim with the friendly sea lions. Our third snorkeling site is Jureles. At this site we spend approx 15-20 minutes swimming with thousands of schooling skipjacks. Time permitting, we'll also snorkel at Las Navajas. 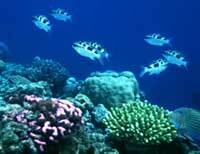 This is a very shallow coral reef with a lot of color and fish. The actual snorkeling time on this tour is approximately THREE TIMES that of most tours in Cabo San Lucas, at about 2.5 hours, and you'll snorkel at three to four separate locations! Cruise Passengers: Sorry, this tour starts too early for most cruise ship schedules. If you're in doubt, ask us! Pickup at Your Cabo San Lucas hotel or the marina in Cabo San Lucas. Roundtrip transportation, snorkeling equipment, certified guide service, snacks, purified water and lunch at a local beach restaurant. Ship Price Compare At Our Price You Save! Cabo Pulmo offers the best snorkeling in the Los Cabos area by a good margin. It's a long drive, at 2 hours, but the payoff is well worth the trip in our opinion. Plus you get to see a bit of the rural East Cape along the way. Government Marine Park Tax of approx. $5.00 US per person must be paid in cash upon arrival to Cabo Pulmo. Large group? We can accommodate up to 100 people with our Private Cabo Pulmo tour.